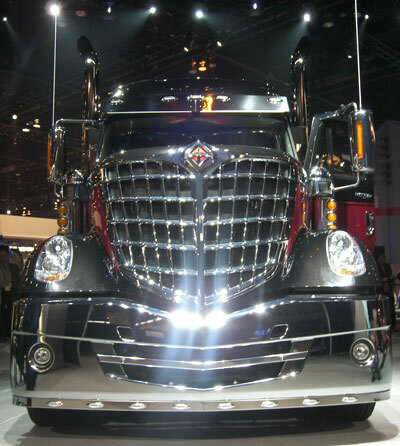 The aerodynamic shape and polished chrome of the LoneStar by International Trucks looks impressive from the outside, but all the sleek metal means little if it lacks driver comfort. To create the unique interior of the LoneStar, Wired.com reports Navistar turned to Carnegie Mellon University professors and design experts Peter Boatwright and John Cagan. According to the story, Boatwright and Cagan consulted industry experts, the truck drivers themselves, on the living space of the LoneStar. They discovered truckers like to modify their cabs to be more like home and divide the space between where they drive and where they live. The result was a truck interior that offers luxuries ranging from an 11 speaker stereo to real hardwood floors. Truckers have been so enthusiastic about the LoneStar that some have even tattooed the truck’s image on their arms. This is a wonderfully colourful posting with loads of images of the interiors of the vehicle. I must say that I have liked this a lot.